"96th Bombardment Wing" redirects here. For the 96th Bombardment Wing of World War II, see 96th Air Division. The 96th Test Wing is a United States Air Force unit assigned to the Air Force Test Center of Air Force Materiel Command at Eglin Air Force Base, Florida. The wing was activated at Eglin in 1994 as the 96th Air Base Wing, the headquarters for all support units on Eglin, the largest installation in the Air Force. In 2012, it absorbed the mission and resources of the 46th Test Wing and added the mission of testing and evaluating weapons, navigation and guidance systems and command and control systems. The wing's first predecessor was organized during World War II as the 96th Bombardment Group. After training in the United States, the group flew Boeing B-17 Flying Fortresses from England. The group led the first shuttle mission to Regensburg on 17 August 1943. The group earned two Distinguished Unit Citations for its combat performance. After VE Day, the group returned to the United States and was inactivated. The group was briefly active in the Air Force Reserve from 1947 until 1949. The 96th Bombardment Wing was activated in 1953 at Altus Air Force Base, Oklahoma and received Boeing B-47 Stratojet bombers the following year as a component of Strategic Air Command's deterrent force. In 1957 the wing moved to Dyess Air Force Base, Texas where it converted to the Boeing B-52 Stratofortress in 1963 and the Rockwell B-1 Lancer in 1985. The wing also operated air refueling aircraft, and during the early 1960s was assigned a squadron of intercontinental ballistic missiles. In 1984, the World War II group was consolidated with the wing. The wing was inactivated in 1993 and its mission, personnel and equipment were transferred to the 7th Bomb Wing, which moved on paper to Dyess when Carswell Air Force Base became a reserve installation. The 96th Test Wing performs developmental test and evaluation for Air Force weapons while also providing support for all other units on Eglin Air Force Base as the installation host wing. Eglin is the Department of Defense's largest Air Force installation. Supported units include three wings, the Armament Systems Directorate, nine operating locations, five detachments and more than 25 associate units. The group plans and executes Developmental Test and Evaluation (DT&E) of Command and Control, Communications, Computer, Intelligence, Surveillance, and Reconnaissance (C4ISR) and Cyber Systems. The group conducts developmental testing and evaluation of conventional munitions, command and control systems, McDonnell Douglas F-15 Eagle and Fairchild Republic A-10 Thunderbolt II avionics, and navigation and guidance systems. The group manages and maintains 41 modified test aircraft. The group is located at Holloman Air Force Base, New Mexico. It operates test facilities for high speed sled track testing, navigation and guidance system testing, radar signature measurements, weapon systems flight testing, and Air Force liaison for all AF programs tested at White Sands Missile Range. The group's Operating Location AA at Kirtland Air Force Base, New Mexico is responsible for directed energy and high energy laser testing and Operating Location AC at Wright-Patterson Air Force Base, Ohio, performs landing gear and aircraft survivability tests. The group provides fuels, supply, transportation, ground combat training, security, communication, personnel, education, family services, lodging, food service, recreation and logistics planning and deployment support to approximately 20,000 military and civilian personnel and 43,000 retirees. It also deploys combat ready forces in support of worldwide contingency operations. The group provides engineering forces to operate and maintain the physical plant, infrastructure, facilities and systems, housing, and the environment, and maintains 11.6 million square feet of physical plant and 3,256 facilities. The group operates the Eglin Gulf Test Range, which consists of approximately 120,000 square miles of overwater airspace, covering the eastern third of the Gulf of Mexico from the Florida Panhandle to the Florida Keys. The land range covers 724 square miles and contains 70 specific test and training areas, including an approved depleted uranium test range and the only qualified air-to-ground supersonic range east of the Mississippi River. The group manages and provides health care for 83,000 eligible beneficiaries. It operates a community-based teaching hospital with graduate level programs in family practice, general dentistry and other medical disciplines. The group was first activated in July 1942 at Salt Lake City Army Air Base, Utah as the 96th Bombardment Group, with the 337th, 338th, 339th and 413th Bombardment Squadrons[note 5] assigned as its original components. After moving to Gowen Field, Idaho the group received its initial cadre. The group trained at various bases in the northwestern United States. In November 1942 the group moved to Pocatello Army Air Base, Idaho, where it acted as an Operational Training Unit (OTU). OTUs were oversized parent units that provided cadres to form "satellite groups." In early 1943, the 96th relocated to Pyote Army Air Base, Texas, where it resumed its combat training. In April 1943 the group began its overseas movement. The air echelon ferried its bombers via the North Atlantic Ferry Route, while the ground echelon proceeded to the New York Port of Embarkation and sailed on the RMS Queen Elizabeth for Greenock, Scotland. The group arrived at RAF Grafton Underwood England in May 1943, for duty with Eighth Air Force. The group was assigned to the 45th Combat Bombardment Wing of the 3d Bombardment Division. The group commenced combat operations on 14 May with an attack on Kortryk (Courtrai), after an aborted mission the previous day. The 96th moved east at the end of May to RAF Andrews Field. The 96th appears to have only carried out one mission while based at Andrews. On 29 May 1943 they took part in a raid on Rennes naval storage depot from which one B-17 failed to return. However, Eighth Air Force was not pleased with the initial performance of the Martin B-26 Marauder units assigned to it and decided to move them from their bases in north Suffolk to stations nearer the continent. As the first step in this move, the 386th Bombardment Group left its base at RAF Snetterton Heath for RAF Boxted. The 96th took the 386th's place at Snetterton Heath the following day, leaving its previous base available for the 322d Bombardment Group. As the most conveniently reached station from 3d Air Division Headquarters at Elveden Hall, Snetterton Heath units often led to major operations carrying commanding generals. General Curtis LeMay led the Regensburg shuttle mission to North Africa flying out of this base, and the group received a Distinguished Unit Citation for withstanding severe assaults by enemy fighters. The 96th also led the 3d Division on the Schweinfurt mission of 14 October 1943. In addition, the 96th attacked shipyards, harbors, railway yards, aerodromes, oil refineries, aircraft factories, and other industrial targets in Germany, France, the Netherlands, Belgium, Norway, Poland, Hungary, and Czechoslovakia. The 96th received another Distinguished Unit Citation for leading the 45th Wing a great distance through heavy clouds and intense flak to raid important aircraft component factories in Poland on 9 April 1944. Other significant targets attacked by the group included airfields at Bordeaux and Augsburg; marshalling yards at Kiel, Hamm, Brunswick, and Gdynia; aircraft factories at Chemnitz, Hanover, and Diósgyőr; oil refineries at Merseburg and Brüx, and chemical works in Wiesbaden, Ludwigshafen, and Neunkirchen. In addition to its strategic operations, the 96th was occasionally diverted to support ground forces. These missions included bombing coastal defenses, railway bridges, gun emplacements, and field batteries in the battle area prior to and during D-Day in June 1944. It attacked enemy positions to support the breakthrough at Saint-Lô in July 1944and aided the campaign in France in August by striking roads and road junctions and by dropping supplies to the Maquis. In the early months of 1945, the group struck lines of communications supplying German armies on the western front. After V-E Day, the 96th flew food to the Netherlands and transported redeploying personnel to French Morocco, Northern Ireland, France, and Germany. the group was programmed to move to Germany for occupation duty. However, plans were revised in September 1945. In November 1945 its aircraft were flown back to the United States or transferred to other units. Two of its squadrons were inactivated in late November and the others in mid-December. The group headquarters' remaining personnel left Snetterton Heath, sailing on the USS Lake Champlain on 12 December and arriving at Camp Kilmer New Jersey on 20 December 1945, where it was inactivated the following day. The 96th Bombardment Group was activated as a reserve unit under Air Defense Command (ADC) on 29 May 1947 at Gunter Field, Alabama. It was initially assigned three of its World War II units, the 337th Bombardment Squadron, located at Gunter, and the 338th and 339th Bombardment Squadrons, stationed at Hawkins Field in Mississippi. In July, it added three additional squadrons, the 413th Bombardment Squadron at Keesler Air Force Base in Mississippi, the 546th Bombardment Squadron at Lovell Field in Tennessee, and the 547th Bombardment Squadron at Smith Reynolds Airport in North Carolina. In October, however, the two squadrons at Jackson were transferred to the 384th Bombardment Group. At Gunter, the group conducted routine training activities under the supervision of the 476th AAF Base Unit (later the 2586th Air Force Reserve Training Center). President Truman’s reduced 1949 defense budget required reductions in the number of units in the Air Force, and the 96th Group and 2586th Center were inactivated in July 1949 and not replaced as flying operations at Gunter ceased. The 96th Bombardment Wing was activated in November 1953 at Altus Air Force Base, Oklahoma. Wing headquarters and most of the wing components were not manned until March 1954; those components were controlled by the 96th Air Base Group, whose commander served additional duty as the 96th's wing commander. The wing soon received Boeing KC-97 Stratotankers and began air refueling operations in March 1954. The wing began training with Boeing B-47E Stratojet swept-wing medium bombers, capable of flying at high subsonic speeds, in April 1955 in support of SAC's global commitments. It deployed to Andersen Air Force Base Guam from January through April 1957. The wing joined the 341st Bombardment Wing at Dyess Air Force Base, Texas on 8 September 1957. The 4th Strategic Support Squadron, a strategic airlift squadron flying Douglas C-124 Globemaster IIs, moved to Dyess from Ellsworth Air Force Base in 1957. It was assigned to the wing from September 1959 until it was inactivated in March 1961. The wing added intercontinental ballistic missiles to its nuclear strike force when the 578th Strategic Missile Squadron, with Convair SM-65 Atlas missiles joined the wing in July 1961. The first Atlas missile went on alert in April 1962. The wing's Atlases were phased out in March 1965. Soon after detection of Soviet missiles in Cuba, on 22 October 1962, SAC's B-47s were dispersed. Dispersing bombers carried nuclear weapons in ferrying configuration. On 24 October SAC went to DEFCON 2, placing all its combat aircraft on alert. Most dispersal bases were civilian airfields with Air Force Reserve or Air National Guard units. The B-47s were configured for execution of the Emergency War Order as soon as possible after dispersal. On 15 November, 1/6 of the dispersed B-47s were recalled to their home bases. On 21 November SAC relaxed its alert posture to DEFCON 3. its dispersed B-47s and their supporting tankers were recalled on 24 November. On 27 November SAC returned to normal alert posture. By the early 1960s, the B-47 was being phased out of SAC's strategic arsenal. In June 1961, the 341st Bombardment Wing had been inactivated and the 96th became the single Stratojet wing at Dyess. In March 1963, two of the wing's bomber squadrons were inactivated, and by December 1963, its remaining squadron had converted to the Boeing B-52 Stratofortress. The 96th received B-52Cs from the 99th Bomb Wing from Walker Air Force Base in Roswell, New Mexico. In 1970 and again 1972-1973, most wing personnel and all of its aircraft and crews deployed to the Pacific in support of the War in Vietnam. During most of this time, the 96BW also supported Operation Chrome Dome missions over the North Pole in the Cold War. From 1980, the wing's 917th Air Refueling Squadron's Boeing KC-135A Stratotanker aircraft regularly deployed to Europe, Alaska, and the Pacific to support SAC tanker task force requirements. The 337th Bombardment Squadron became the first squadron to operate the Rockwell B-1B Lancer, after the arrival of the first aircraft in June 1985. In October 1986, B-1Bs assumed SAC Cold War alert duties for the first time. In addition, the 338th Combat Crew Training Squadron received B-1Bs in June 1992. 917th Squadron tankers provided refueling support to units involved in Operation Just Cause, the December 1989 incursion that replaced Manuel Noriega as ruler of Panama. The following August, they ferried personnel and equipment to Andersen Air Force Base, Guam for further movement to Southwest Asia. In December 1990 all remaining tanker aircraft and crews, except those on alert duty, were sent to Incirlik Air Base, Turkey in support of Operation Desert Storm. On 1 September 1991, the wing was redesignated as the 96th Wing and implemented the objective wing concept. It was relieved from assignment to SAC and assigned to Air Combat Command on 1 June 1992. Also on 1 June 1992, the 917th Squadron acquired KC-135Qs in conjunction with the drawdown of tanker operations at Beale Air Force Base, California. When tanker squadrons were reassigned to Air Mobility Command, the 917th was reassigned to the 43d Operations Group, headquartered at Malmstrom Air Force Base, Montana on 30 September 1993. On 1 October 1993 the 96th Wing inactivated, replaced by the 7th Wing, which moved without personnel or equipment due to the 1993 Base Realignment and Closure Commission transfer of Carswell Air Force Base, Texas to the U.S. Navy . The B-1Bs of the 337th Squadron were reassigned to the 7th Wing, and the 337th absorbed the B-1s of the inactivating 338th Crew Training Squadron as part of the new wing. The 96th Air Base Wing stood up as a non-flying organization on 15 March 1994. It assumed the mission of supporting the Air Armament Center and associate units at Eglin Air Force Base, Florida. The wing became the 96th Test Wing, assuming the 46th Test Wing mission, as part of the 2012 Air Force Materiel Command Restructuring. It is the test and evaluation unit for Air Force air-delivered weapons, navigation and guidance systems, command and control systems and Air Force Special Operations Command systems. The wing performs developmental test and evaluation for a wide variety of customers including: Air Force Systems Program Offices, the Air Force Research Laboratory, Materiel Command's logistics and product centers; major commands; other Department of Defense services and U.S. government agencies (Department of Transportation, NASA, etc. ); foreign military sales; and private industry. ^ The emblem was approved 18 February 1943. ^ Aircraft is Lockheed/Vega B-17F-50-VE Flying Fortress serial 42-6153. This aircraft survived the war and was sent to the Reconstruction Finance Corporation at Kingman Army Air Field on 30 October 1945. 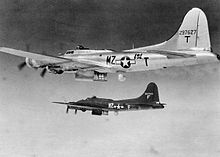 ^ Aircraft in the foreground is Lockheed/Vega B-17G-20-VE Flying Fortress serial 42-97627. ^ Aircraft is Boeing B-17G-70-BO Flying Fortress serial 43-37683. ^ The 413th Squadron was constituted as the 23d Reconnaissance Squadron, but was redesignated before it was made active. Maurer, Combat Squadrons, p. 505. ^ Christened the "Star of Abilene", serial 83-65. Pictured on the flightline at Dyess AFB after flying its last mission in 2003. ^ a b c d e f g h i j k l m n o p q r s t u v w x y z aa ab ac ad ae af ag ah ai aj ak al am an Robertson, Patsy (16 October 2010). "Factsheet, 96 Air Base Wing (AFMC)". Air Force Historical Research Agency. Archived from the original on 27 September 2015. Retrieved 4 October 2016. ^ a b c d e f g h "Fact Sheet 96th Test Wing". 96th Test Wing Public Affairs. 18 March 2015. Archived from the original on 23 April 2016. Retrieved 4 October 2016. ^ Azzano, Christopher, Colonel, USAF, "New commander happy to be back", The Eglin Dispatch, Northwest Florida Daily News, Fort Walton Beach, Florida, Friday 19 June 2015, Volume 9, Number 25, page 9. ^ "Fact Sheet 96th Test Group". 49th Fighter Wing Public Affairs. Retrieved 22 June 2016. ^ See Mueller, p. 218 (dates 476th Base Unit/2586th Center stationed at Gunter). ^ Kane, Robert B. (6 April 2012). "Factsheet 341 Missile Wing (AFGSC)". Air Force Historical Research Agency. Retrieved 25 June 2016. ^ Haulman, Daniel L. (4 December 2007). "Factsheet 43 Operations Group (AMC)". Air Force Historical Research Agency. Retrieved 19 June 2014. ^ Robertson, Patsy (5 November 2007). "Factsheet 7 Bomb Wing (ACC)". Air Force Historical Research Agency. Retrieved 24 May 2014. ^ "AFMC Prepares for 5-Center Transition". Air Force Materiel Command Public Affairs. 19 June 2012. Retrieved 26 June 2012. ^ a b "96 Test Wing" (PDF). 96th Test Wing Public Affairs. October 2014. Retrieved 21 June 2016. ^ a b c Station number in Anderson. This article incorporates public domain material from the Air Force Historical Research Agency website http://www.afhra.af.mil/. Anderson, Capt. Barry (1985). Army Air Forces Stations: A Guide to the Stations Where U.S. Army Air Forces Personnel Served in the United Kingdom During World War II (PDF). Maxwell AFB, AL: Research Division, USAF Historical Research Center. Archived from the original (PDF) on 4 March 2016. Retrieved 7 July 2012. Craven, Wesley F; Cate, James L, eds. (1955). The Army Air Forces in World War II. Vol. VI, Men & Planes. Chicago, Illinois: University of Chicago Press. LCCN 48003657. OCLC 704158. Freeman, Roger A. (1970). The Mighty Eighth: Units, Men and Machines (A History of the US 8th Army Air Force). London, England, UK: Macdonald and Company. ISBN 978-0-87938-638-2. Kipp, Robert; Peake, Lynn; Wolk, Herman. "Strategic Air Command Operations in the Cuban Crisis of 1962, SAC Historical Study No. 90 (Top Secret NOFORN, FRD, redacted and declassified)". Strategic Air Command. Retrieved 21 November 2014. Maurer, Maurer, ed. (1983) . Air Force Combat Units of World War II (PDF) (reprint ed.). Washington, DC: Office of Air Force History. ISBN 0-912799-02-1. LCCN 61060979. Maurer, Maurer, ed. (1982) . Combat Squadrons of the Air Force, World War II (PDF) (reprint ed.). Washington, DC: Office of Air Force History. ISBN 0-405-12194-6. LCCN 70605402. OCLC 72556. Mixer, Ronald E. (1999). The genealogy of the Strategic Air Command. Apopka, FL: Battermix Publishing Co. ASIN B0006RK1OW. Mixer, Ronald E. (2006). Strategic Air Command, an organizational history. Apopka, FL: Battermix Publishing Co.
Mueller, Robert (1989). Air Force Bases, Vol. I, Active Air Force Bases Within the United States of America on 17 September 1982 (PDF). Washington, DC: Office of Air Force History. ISBN 0-912799-53-6. Rogers, Brian. (2005). United States Air Force Unit Designations Since 1978. Hinkley, UK: Midland Publications. ISBN 1-85780-197-0. . This page was last edited on 24 February 2019, at 00:39 (UTC).